Ingredients: 100% Pure Organic Coconut! 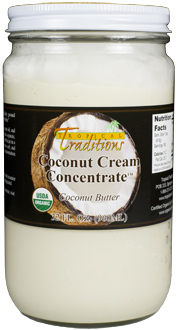 Coconut Cream Concentrate is certified organic whole coconut meat in concentrated form. It is sometimes referred to as "coconut butter." It contains no additives* (not even water). The dried coconut meat is ground very finely, giving it a creamy consistency due to its high fat content, much like other nut butters. Since it is 70% fat, it is a rich source of pure coconut oil. Note: this is a food, not a cooking oil. Commercial coconut milks and creams are generally sold in cans, or sometimes boxes and tetra packs. The main ingredient in these products is water. If the fat content is 17%, it is called "coconut milk." If the fat content is 24%, it is called "coconut cream." But most of what you are purchasing is water. Coconut Cream Concentrate, on the other hand, has NO water, and is pure coconut. Unlike the commercial varieties, it also contains ALL the fiber of the coconut. Pure, dried coconut contains more fiber per gram than even oat bran! 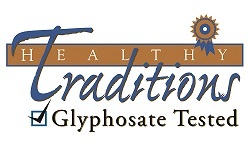 This fiber has been stripped out of commercial coconut milks and coconut creams. Also, almost all commercial coconut milks and creams have additives to prevent the water from separating from the coconut oil, and also have sulfites added to keep it white longer. Sometimes these additives are so small, that the FDA does not require them to list them on their labels as ingredients. Coconut Cream Concentrate, however, contains NO additives and NO preservatives at all: it is 100% natural coconut made from certified organic Philippine coconuts grown without pesticides or fertilizers. Coconut Cream Concentrate comes packaged in 1 quart glass jars.